What makes video quality better? 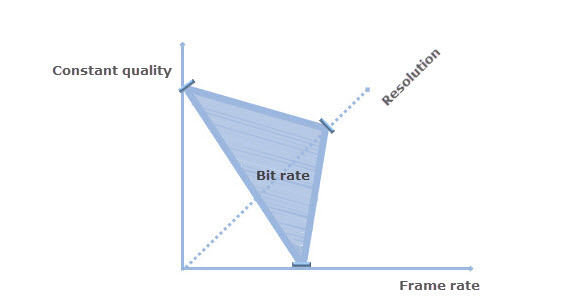 Besides resolution, frame rate and bit rate, video quality are also affected by video codec, bit depth, etc. • What factors determine the quality of a video? • How to avoid video quality loss when transcoding or uploading to YouTube? 1. The factors that determine the quality of an uncompressed videos are: video resolution, video frame rate and macroblock. Technically, there is no way to 100% avoid loss of data when compressing or transcoding a video. That's what encoding is designed for, to clear redundant information as much as possible. Maybe it causes quality loss. And the reason for "maybe" is that it can be prevented visually when conducting in a proper way with a prefessional-level video encoder. Being a GPU-accelerated video processing tool, WinX HD Video Converter Deluxe allows you to control output quality of GoPro, DJI, iPhone videos through deshaking, reducing noise, re-encoding, upscaling or downscaling video resolution, adjusting frame rate or bit rate, correct fisheye, etc. Why do so many people prefer IMAX movies despite the ticket always running $5 or $6 higher than that of a regular film? Guess the answer will be as simple as it is worth every penny. Apparently, the perfect match of huge screen and ultra high definition leads to the best-ever immersion, which is so hard to reach at home. And the first step is always the hardest - to single out a video source for downloading and watching in the best quality. If you also need to prevent video quality loss from editing, transcoding or uploading, then you get piles of problems to figure out, the top priority among which would be what factors decide video quality. What are the factors that affect or decide video quality? Video resolution, bit rate and frame rate are taken as the correct answers everywhere. It is close but not complete. The quality of an encoded video also depends on video codec, bit control mode and bit depth. If what we are talking about is visual quality, real-world viewing conditions should be counted in as well, for example, the viewing angle and distance, display size/resolution, decoding ability of video player, lighting, etc. Here we will focus on explaining the main factors that affect a compressed video quality, making it easy for you to know how to mediated these video parameters with a video processing software to control video quality. Instead of a large chunk of dizzy words, we list all must-know information for you one by one as follows. 1. What is video resolution? A video is a continuous display of a group or groups of still images at a certain speed. So when we say video resolution, we actually mean image resolution. There is no "video resolution" term on Wikipedia. Take your familiar 1080p as an example. 1080p means a video composed of images with 1080 horizontal lines from top to bottom, each of which is 1920 pixels wide. 2. How does resolution affect video quality? In digital imaging, resolution equals to pixel count. The total pixels of a 1080p video are 1920x1080 = 2,073,600, while 3840x2160 = 8,294,400 pixels in 4K, 4 times more details. The higher the resolution, the more the pixels and the better the video quality. 3. Does up-converting resolution make video clearer? It depends. Sometimes forcibly upscaling a video may destroy the image quality. Video resolution is originally decided by recording settings, but can be changed in post processing. Auto up-conversion by TV is nowhere near as clear as that by video converter software. Because video upscaler software like WinX HD Video Converter Deluxe comes with unique motion adaptive pixel scaling algorithm, adding new interpolated pixels according to the nearest sample points. Better still, it controls the diffusion/sharpening based on the input image, making it easy to upscale 1080p to 4K, downscale 4K to 1080p and ensure good perceived quality, despite the inevitable data loss when downscaling. But try not to upscale a video anytime you have other better options. 1. What is frame rate? Video is made of still images and only if images are displayed consecutively at a certain speed can it be perceived as a video. The "certain speed" is frame rate, or frame frequency, expressed in fps. Here frame and image is the same thing. 2. How does frame rate affect video quality? Frame rate does not affect video quality directly. It decides the fluidity, which in turn affects visual effects. Guess that a footage stuttering badly is by no means a HQ video. Frame rate being too high or too low will cause "unnatural" problem. So proper frame rate is important to make your video look realistic, just as how we see motions in real life. 3. What frame rate should you use to ensure video quality? A movie footage recording at 24 fps normally looks smooth while video games and sports videos look choppy and terrible. So there is no best frame rate for all videos. But we do have standards to refer to. While films are usually played at 24 fps, news live broadcasts use 30fps. Frame rate higher than 60 fps is mainly used in videos with a lot of motions, such as sports videos and used for slow motion creating. The higher the frame rate, the crisper the video. Besides, high frame rate is good for post editing. 1. What is video codec? Video codec, or specifically video coding format here, is the way of video encoding, such as MP4 H.264 and MP4 HEVC. Different video codec comes with different compression algorithm and ratio. 2. How does video codec affect video quality? Video codec actually affects output video file size. Suppose that all other parameters are the same, a video encoded in HEVC will be almost 50% smaller than that of H.264 or DivX, despite the same video quality. To put it another way, video encoded in HEVC will be more vivid than H.264/DivX when compressed to the same file size. Higher compression ratio leads to less detail loss, thereby preserving better viewing quality. 3. What video coding format should you use to ensure video quality? Videos in different resolutions for playing on various devices should be encoded in different codec formats. MP4 H.264 is the most recommended format for its wide compatibility and best balance between video quality and file size. • Extract DVD into MPEG-2 in original quality! 1. What is bit rate? The video bit rate is the amount of bits required to encode a single second of video. The higher the bit rate, the bigger the data processed. 2. How does bit rate affect video quality? Bit rate is the main factor that decides video file size (video size = bit rate x duration). Also it affects video quality. Higher bit rate normally brings better video quality. But there is diminishing marginal utility effect, meaning when video quality reaches a certain level (same as the original), the increasing of bit rate will only result in bigger file size without enhancement in quality. 3. What bit rate should you use to output video in best quality? What bitrate should you choose when recording, for example, a 4K video for uploading to YouTube? Well, there are several things to be considered. Firstly, adjust bit rate according to the resolution, FPS and Constant Quality of video. To be specific, the bit rate for 4K video should be higher than that of 1080p. Bit rate for 4K 60fps video should be higher than that for 4K 30fps. And bit rate for 4K 20 CQP is definitely larger than that for 4K 30 CQP. Secondly, upload speed also matters. If you only have 20Mbps upload speed, choose the lowest possible bit rate 35 Mbps for a 4K video uploading to YouTube, since the numbers among 35 to 45 Mbps are all allowed. Well, stuttering and long-time uploading is inevitable. The good thing is that some video editor software like WinX HD Video Converter Deluxe offers you up to 370+ presets, each of which comes with proper bit rate. So just choose your desired output format or device, and forget about the bitrate calculating. 1. What is rate control mode? Rate control mode is the way of bits allocating for a given frame. There are kinds of rate control modes in the most popular x264/x265 encoder, including CQP, Bitrate and CRF. Bitrate can be divided into CBR, ABR and VBR. While CQP is a mode targeted on the compression for every Macroblock in a frame and Bitrate focuses on file size, CRF allocates bits intelligently to control the output video quality. CRF ranges from 0 to 51, the same as QP, but it delivers smaller-size file at same good quality by giving more bits to complex segments and less data to simple ones. 18-20 is suggested for SD videos in x264 and 20-23 for HD. 2. How does rate control mode affect video quality? Video encoding is to remove redundant data and compress video file size for saving as many bits as possible for delivering frames, which is realized through kinds of rate control modes. Compression in that process always leads to data loss, and then affects video quality. So to very well control the tradeoff between quality and file size, you should choose the rate control mode carefully. CRF and 2-pass VBR are suggested to ensure good quality. 3. What rate control mode should you use to ensure best video quality? The truth is there is no one-size-fit-all rate control mode. Different bit rate control modes only output video well and fast under certain conditions. And sometimes it is just an either-or situation. You have to choose one, good quality or quick encoding. Basically, living streaming are strictly limited in bit rate, so constant bitrate (CBR) and average bitrate (ABR) will be more appropriate. For streaming, choose rate control mode based on your primary need - size and quality. 1-pass VBR Good quality Variable Quick encoding Encoding for watching on devices temporarily. 1. What is bit depth? Bit depth, or Color depth, refers to the number of bits used for each color component of a single pixel. To put it simply, bit depth decides how much information can be stored in a frame. Most digital video formats we use are 8 bits per color channel and most displays support only 8 bits for now. 2. How does bit depth affect video quality?